When I started snowboarding, it was the beginning of a new sport. My hometown was Lake Louise, Alberta in the Canadian Rocky Mountains. There resided a deep talent of snowboard legends and a brotherhood known as ‘Team Core’. After graduation, I moved to Whistler to pursue my career as a Professional Snowboarder, as many other riders did in the 90’s. My career as a big mountain snowboarder allowed me to gain knowledge and experience through riding and working with some of the best snowboarders, media and mountain terrain in the world. With having had unsupportive sponsorships, injury and many close calls, I retired in 1998. 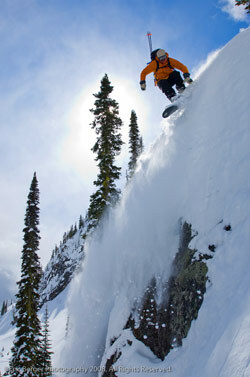 I moved to Revelstoke, took up splitboarding and started to work as a tail guide at a local cat ski operation. I then began the process of exams, courses and gaining the experience needed to become a guide. In the spring of 2006, after many years of hard work, dedication and sacrifice, I became the first snowboarder to pass the Association of Canadian Mountain Guides - assistant ski guide exam. Done all on my splitboard.